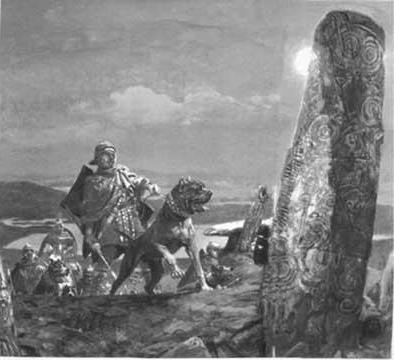 Its direct ancestor is the "Canis Pugnax" (the old Roman Molossian) of which he is the light version employed in the hunting of large wild animals and also as an "auxiliary warrior" in battles. For years he has been a precious companion of the Italic populations. Employed as property, cattle and personal guard dog and used for hunting purposes too. In the past this breed was common all over Italy as an ample iconography and historiography testify. In the recent past he has found a excellent preservation area in Southern Italy, expecially in Puglia, Lucania and Sannio. 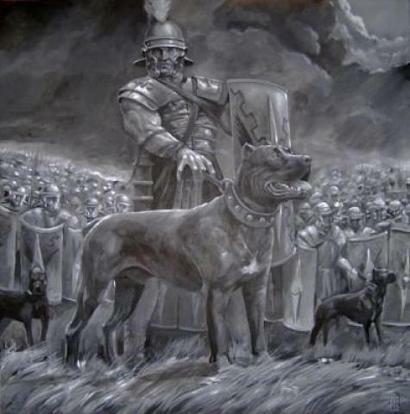 His name derives from the Latin "Cohors" which means "Guardian", "Protector". 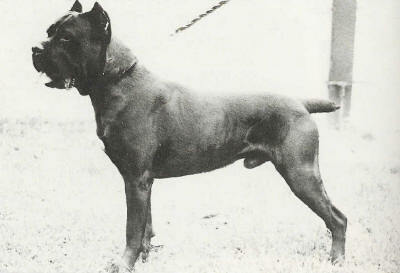 Medium-big size dog, strongly built but elegant, with powerful and long muscles, very distinguished, he expresses strength, agility and endurance. The general conformation is that of a mesomorphic animal whose body is longer than the height at the withers, harmonious as regards the form and disharmonious as regards the profile. The lenght of the body is about ll% over the height at the withers. The total length of the head reaches 3,6/10 of the height at the withers. The lenght of the muzzle is equal to 3,4/10 of the total lenght of the head. The height of the thorax is 5/10 of the height at the withers and it is equal to the height of the limb at the elbows. Intelligent, active and even-minded, he is an unequalled watch and protection dog. Docile and affectionate with the owner, loving with children and with the family, if necessary he becomes a terrible and brave protector of people, house and property. He is easily trained. 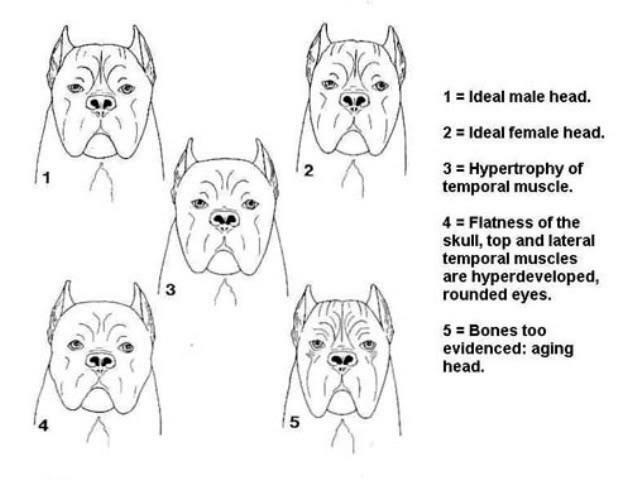 Brachycephalic. Its total length reaches 3,6/10 of the height at the withers. The bizygomatic width, which is equal to the lenght of the skull, is more than half the total height of the head, reaching 6,6/10. The upper longitudinal axes of the skull and of the muzzle are slightly convergent. The perimeter of the head, mesured at the cheek-bones, is more than twice the total length of the head even in the females. The head is moderately sculptured with zygomatic arches stretched outwards. The skin is firm and sticking to the tissues underneath, it is smooth and quite stretched. Skull - Seen from the front it is wide and slightly curved, seen from the side it draws an irregular curve that, accentuated in the subregion of the forehead, becomes flat along the external saggital crest. Seen from the top, it looks square because of the outstretching of the zygomatic arches and the powerful muscles swathing it. Frontal sinuses well developed and stretched forward, deep forehead hollow and visible median furrow. Occipital crest not much developed. Supraorbital fossae slightly marked. Stop - Very marked because of the very developed and. bulging frontal sinuses and because of the prominent superciliary arches. Nose - It is on the same line as the nose pipe. Seen from the side it mustn't stick out from the front vertical margin of the lips but be, with its front, on the same vertical line as the front of the muzzle. It has to be voluminous, rather flat on top, with wide nostrils, opened and mobile, wet and cool. The pigmentation is black. Muzzle - Very broad and deep. The width of the muzzle must be almost equal to its lenght, which reaches 3,4/10 of the total lenght of the head. Its depth is more than 50% the lenght of the muzzle. Due to the parallels of the muzzle sides and to the fullness and the width of the whole jaw, the anterior face of the muzzle is flat and square. The nasal bridge has a rectilinear profile and it is rather flat. The lower side profile of the muzzle is determined by the upper lips, the suborbital region shows a very slight chisel. Lips - Rather firm. Seen from the front, the upper lips form at their disjunction an upside down "U" and, seen from the side, hang moderately. The commisure is rightly evident and it always represents the lowest point of the lower side profile of the muzzle. The pigmentation is black. Jaws - Very wide, strong and thick, with a very slight shortening of the upper jaw with a subsequent light prognathism (undershot mouth). The branches of the lower jaw are very strong and, seen from the side, are quite curved, the body of the lower jaw, well accentuated forward, points out well the marked chin. The incisors are firmly placed on a straight line. Cheeks- The masseter region is full and evident, but not hypertrophic. Teeth - White, big, complete in growth and number. The lower jaw incisors pass only slightly (about 1/2 cm) their correspondent ones on the upper arch, so the bite is slightly undershot. Eyes - Of medium size compared to the size of the dog, in a sub-frontal position, well spaced. Rima palpebrarum nearly oval, eyeballs slightly protruding, adherent eyelids with the borders pigmented with black, the eye mustn't let the sclera be seen. Third eyelid strongly pimented. Iris as dark as possible according to the colour of the coat. Look intelligent and alert. 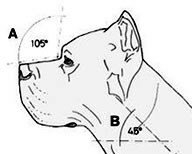 Ears - Of medium size in relation to the volume of the head and to the size of the dog; covered with short hair, of triangular shape, with rather pointed apex and thick cartilage, in a high position, much above the zygomatic arch, with a wide bottom, hanging, they stick to the cheeks without coming down to the throat. Quite outstretched and slightly protruding at the joint, they become semi-erect when the dog is watchful. They usually get amputated in a equilateral-triangular shape. Top line - Slightly arched. Lenght - 3,6/10 of the height at the withers, that is equal to the total lenght of the head. Shape - Of oval section, strong, very muscular, with a marked disjunction form at the nape. 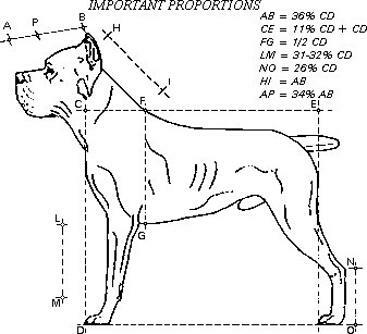 The perimeter, at half lenght of the neck, is about 8/10 of the height at the withers. Harmoniously joined with the withers, shoulder and chest, the neck has its ideal direction at 45ƒ from the ground and at right angle with the shoulder. Skin - The lower margin of the neck is practically without dewlap. BODY - Compact, strong and very muscular. Its lenght is 11% over the height at the withers, with allowance of ±1%. Top line - The back region is rectilinear with a slightly lombar convexity. Withers - They clearly rise on the dorsal line and over the rump level, are high, long, wide. They are lean and joint harmoniously to the neck and to the back. Back - It is wide, very muscular as the whole upper line of the trunk, slightly climbing from the back to the front and with a strictly rectilinear profile. Its length is approx. 32% of the height at the withers. Loins - - The lumbar region has to be short, wide, well joined to the backand to the back and to the rump, very muscular, very solid and, seen from the side, slightly convex. Its length, slightly higher than its width, is equal to 20% of the height at the withers. Croup - It is long, wide, quite round due to the considerable growth of the muscles. The length, measured from the ridge of the hip to the ridge of the nates is equal to 32% of the height at the withers. Its average width is equal to 23% of the height at the withers, its inclination on the horizontal line, on the basis of the ilium-ischiatic line is of 28ƒ/30ƒ, on the basis of the line from the ridge of the hip to the insertion of the tail is of 15ƒ/16ƒ. Therefore the rump is slightly inclined. Chest - - Wide, well inclined and open, with well grown muscles. Its width, in close relation with the width of the thorax, reaches 35% of the height to the withers, the breast-bone is at the same height as the tip of the shoulders. Seen from the side, the chest is outstretched forward between the fore legs and slightly convex. Thorax - It has to be well grown in the three dimensions with long, oblique, wide and well hoped ribs with wide intercostal spaces. The 4 false ribs are long, oblique and open. The thorax reaches down at the elbow and its height is equal to half the height at the withers. Its width, measured at half of its height, is equal to 35% of the height at the withers and decreases slightly towards the sternum region without forming a carina. The depth (saggital diameter) is equal to 55% the height at the withers. Its perimeter is over 35% the height at the withers. Underline and belly - - The sternum region is lean, long, wide and seen from the side it outlines a semicircle with a wide radius which caudally goes up smoothly to the abdomen. The abdomen region is neither hollowed nor relaxed and, seen from the side, rises up from the sternum edge to the groins with a smooth curve. The hollow on the side is not very marked. Tail - It is inserted quite high on the rump line, it's thick at the root and not too tapering at the tip, and if stretched is not too much over the hock. When not in action is low. Otherwise is horizontal or slightly higher than the back, it must never be bent to form a ring or in a vertical position. It gets amputated at the 4th rib. 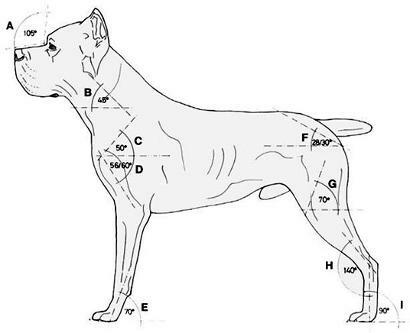 FOREQUARTERS - - Perpendicular, seen from the front or in profile. The height of the limbs at the elbows is equal to 50% of the height at the withers. Well proportioned to the size of the dog. Strong and powerful. Shoulder - Long, oblique, strong, equipped with long, powerful and well divided muscles, is adherent to the thorax but free in the movements. Its length, from the top of the withers to the ridge of the shoulder, is equal to 30% of the height at the withers and its inclination on the horizontal line is between 48ƒ/50ƒ. In relation to the median plane of the body the ridges of the shoulder-blades are slightly swerved. Arm - It is slightly longer than the shoulder, strong, with very well grown bones and muscles, well joined to the trunk in its top 2/3, measured from the ridge of the shoulder to the tip of the elbow, it has a length equal to 31/32% of the height at the withers and an inclination with the horizontal line of approx 58ƒ/60ƒ. Its longitudinal direction is parallel to the median plane of the body. The angle between the shoulder-blades and the humerus is between 106ƒ and 110ƒ. Elbows - The elbows, long and protruding, adherent but not too close to the ribcage, covered with lean skin, must be like the humeri, on a strictly parallel plane to the sagittal plane of the trunk. The tip of the elbow (olecranon epiphysis) is located on the vertical line lowered from the caudal (or back) angle of the shoulder-blade to the ground. Forearm - It is perfectly vertical, oval section, with several muscles, in particular in the top-third, with a very strong and compact bone structure. Its length, from the tip of the elbow to the one of the arm is equal to 32/33% of the height at the withers. Its perimeter, measured straight underneath the elbow, is equal to 39% of the height at the withers, the carpus-cubital groove is quite marked. Carpal joint - Seen from the front, it follows the straight vertical line of the forearm; it is lean, wide, mobile, thick. Its perimeter reaches 26% of height at the withers, at its top margin the pisiform bone is strongly projected backwards. Pastern - It is quite smaller than the forearm, is very strong, lean, elastic, slightly flexed (it forms with the ground an angle of approx. 75ƒ). Its length must not be over one sixth of the height of the forelimb at the elbow. Seen from the front, it follows the perpendicular line of the forearm and of the carpus. Forfeet - They have a round shape, with very arcuated and gathered toes (cat's foot). Lean and hard soles. The nails are strong, curved and pigmented, there is a good pigmentation also in the plantar and digital pads. HINDQUARTERS - Perpendicular, seen from the front or in profile. Well proportioned to the size of the dog, strong and powerful.Thigh - - It is long and wide, with prominent muscles, therefore the nate ridge is well marked. Its length is over 33% of the height at the withers and the width is never lower than 25% of such height. The thigh-bone axis, quite oblique from the top to the bottom and from the back to the front, has an inclination of 70ƒ on the horizontal line and forms with the coxal axis an angle wich is slightly more than right (coxo-femural angle). Second thigh - It is long, lean, with a strong bone and muscle structure, has a well marked muscular groove. Its length is equal to 32% of the height at the withers and its inclination from the top to the bottom and from the front to the back is of approx. 50ƒ on the horizontal line. Stifle The angle of the stifle joint, is of approx. 120ƒ. Its direction is parallel to the median plane of the body. Hock joint It is wide, thick, clean, with well marked bone. The protruding hock ridge shows clearly the continuation of the leg groove. The distance from the ridge of the hock to the sole of the foot (to the ground) shouldn't be over 26% of the height at the withers. Its direction, in relation to the median plane of the body is parallel. The tibio-metatarsal angle is of approx 140ƒ. Hock (Metatarsus) - It is very thick, lean, rather short, cylindrical, and is always perpendicular to the ground, seen from the side and from the back, its length is equal to approx 15% of the height at the withers (tarsus and foot excluded). Its internal side has to present itself without spur. Hindfeet - They have a slightly more oval shape than the fore ones and a less arched toes. GAIT/MOVEMENT - Long steps, stretched trot, some steps of gallop, but with inclination to stretched trot. SKIN - It is, rather thick, has limited subcutaneous connective tissue and therefore is adherent everywhere to the layers underneath. The neck is practically without dewlap. The head mustn't have wrinkles. The pigment of the mucous membranes is black. The pigment of the soles and the nails must be dark. Hair - Short hair but not smooth, with vitreous texture, shiny, adherent, stiff, very dense, with a light layer that becomes thicker in winter (but never crops up on the covering hair). Its average length is approx. 2/2,5 cm. On the withers, the rump, the back margin of the thighs and on the tail it reaches approx. 3 cm without creating fringes. On the muzzle the hair is very short, smooth, adherent and is not more than 1/1,5 cm. Colour Black, plumb-grey, slate, light grey, light fawn, deer fawn, dark fawn and tubby (very well marked stripes on different shades of fawn and grey). In the fawny and tubby subjects there is a black or grey mask only on the muzzle and shouldn't go beyond the eye line. A small white patch on the chest, on the feet tips and on the nose bridge is accepted. Height at the withers - For males from 64 cm. to 68 cm. For females from 60 cm. to 64 cm. With allowance of ± 2 cm. Weight - Males from 45 to 50 Kg. ratio weight/size O.710(Kg/cm). Females from 40 to 45 Kg. ratio weight/size 0.680 (Kg/cm). FAULTS - Any departure from the foregoing points should be considered a fault and the seriousness with which the fault should be regarded should be in exact proportion to its degree and diffusion. Head - Accentuated parallelism of the axes of the skull and the muzzle very marked converging axes of the skull and the muzzle, converging side lines of the muzzle, scissors bite, pronounced and disturbing undershot mouth. Eyes - Partial and bilateral palpebral depigmentation, wall-eye, bilateral strabismus. Sexual organs - Monorchidism, cryptorchidism, obvious incomplete growth of one or both testicles. Tail - Tailless, short-tail, artificial or congenital. Hair - Semi-long, smooth, fringed. Colours - All colours not prescribed, white patches too wide. Note - Males should have two apparently normal testicles fully descended into the scrotum.